(Newser) – Anti-American sentiment is growing in Syria, where rebels are increasingly frustrated that the US is not giving them more support. 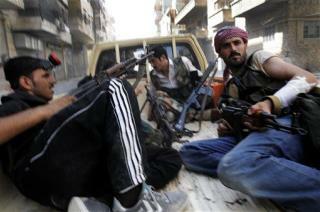 "All we get is words," says a Free Syrian Army spokesperson. The Syrian opposition says it does not want direct military intervention, but it has asked many times for weapons and a no-fly zone like the one that was enacted in Libya. Particularly frustrating to the rebels is the fact that Libya, Egypt, and Tunisia have begun transitioning to democracies while Syria's conflict drags on with no end in sight. And the resentment toward America could certainly be bad news if President Bashar al-Assad is eventually overthrown, the Washington Post notes. Tell our government you've discovered lots of oil. You'll be able to hear the sorties flying overhead soon thereafter.